What a lucky week I had in terms of restoring pens. 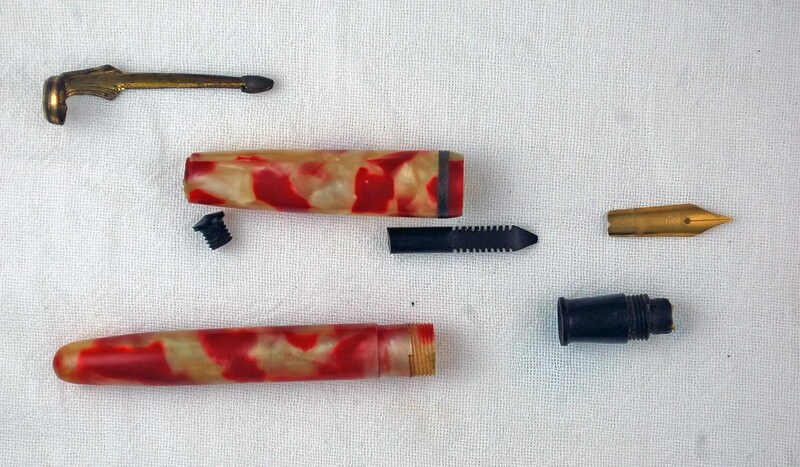 As a result of Fountain Pen Restoration, I received an email from a reader who noticed the post titled “A Yankee In Michigan“. He is a pen enthusiast and collector, and had found two pens that belonged to a grandparent. We should all be so lucky… he sent them to me for repair and I was pleasantly surprised when I opened up the box. The pens are below and were photographed after I took them apart. The top pen is the Moore Tuscan, a full sized model. The second photo below is the Yankee, a Kraker product from Grand Haven, Michigan. I will write more about it next week as I gather some additional information. For this week, I will focus on the Moore. As you can see from the first photo, this is a standard lever filler. The nib was severely discolored and the pressure bar was entirely missing. The pen had definitely been used and at some point, someone had removed the section and taken the old sac and bar out. I proceeded to clean the pen, inside and out, paying special attention to completely scraping the old sac remnants from the section. The Moore is a plastic pen, so the parts can be easily cleaned and polished. Also, the furniture is gold and polishing cleans it up well. You can see that the heavily tarnished nib completely recovered its golden shine. I used a size 18 sac and reattached it to the section / feed / nib assembly. Insertion of the completed assembly into the barrel was simple and these are friction fit. Below are photos of the completed pen, posted and closed. Here is the imprint on the Tuscan. 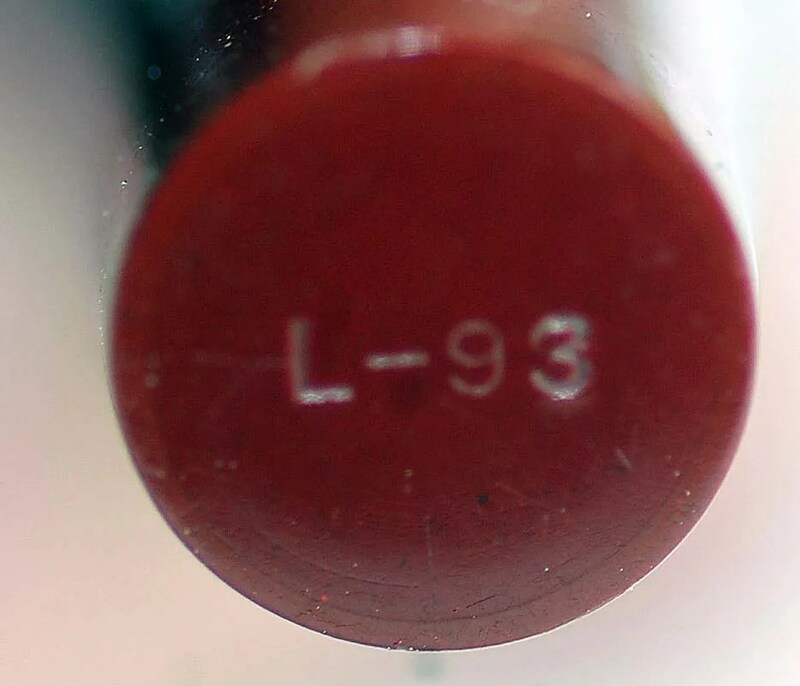 The barrel end identifies this as an L-93 model. The Moore Maniflex Nib ~ I tested this and it is an extra fine, with lots of flexibility. Below is an advertisement from 1925 that appears at Fountain Pen Network (click here for direct link to publisher), showing the Tuscan line of pens and their prices. I believe that this is the second from the top, with a $7.00 price tag. This pen is celluloid, probably dating it after 1925 and closer to 1927 or 1928. I am not a Moore Pen Company expert, but do know that this pen was a contemporary of the Parker Duofold and Sheaffer Flat Tops. It is very attractive, but did not fare as well as those lines. Moore continued in the pen business for quite some time. Additional Moore information can be found here. I have always wanted to own a Tuscan, though they do not appear as often as I would like. The next best thing is to be able to bring one back to life and gaze at it for a while. Now, it is on its way back to the owner, and I hope it brings years of enjoyment. Next week, I will write about the Yankee Pen, which has a surprise nib…. This week’s restoration is from a pen I picked up last May and had not had a chance to work on until this week. Sometimes the good ones get pushed back in the queue, forced to follow the pens that need more work. As you can see, the mottled hard rubber is in quite good condition, though the sac has been reduced to dust. The j bar is in great condition and I will be able to use it again. It had a few rust spots that I was able to sand out with little effort. No new parts will be needed other than a new size 16 sac. I often receive questions as to whether vintage pens should even be resacced, given the potential for the sac to potentially decompose over time and discolor the barrel. I would (and do) respond that it is totally a personal preference. If you are not going to use the pen, I see no reason to place a new sac in it. I tend to use most of my pens, especially just after I restore them. But I do have a few Houston’s that I have not used and I have removed the sacs. Ok, off of the soapbox and back to the workbench…. I thoroughly cleaned the section / feed and nib as there was quite a bit of dried blue ink in and on them. Simple water does the trick on the section and feed, making sure to dry them quickly as water and hard rubber to not get along well. I polished the nib with Pentiques metal polish and a dremel set at low. After I reassembled the section / feed / nib, I reinserted the j bar into the barrel, making certain it was firmly seated back in the barrel and flush with the lever. I polished the clip and lever as well, gently, so that I did not get polish on any of the adjacent hard rubber. The finished product is below. It measures 5 35/64 inches closed and 6 7/8 inches posted. The box that the pen came in is in excellent shape. 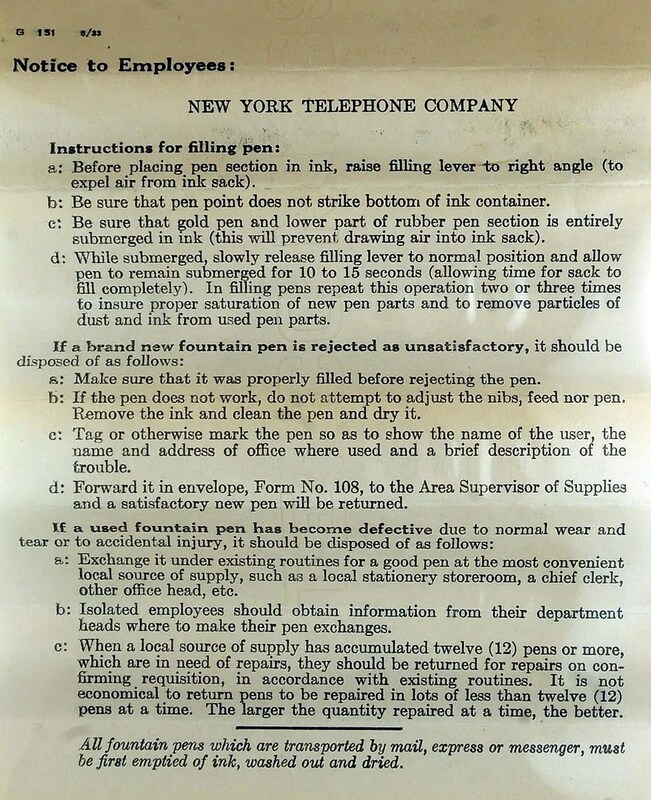 As you can see, the pens were made for the New York Telephone Company. No mystery on this nib – apparently it is a medium. Fortunately, this flyer was in the box and explains that these pens were made for employees of the Company. It is a interesting glimpse into supply chains in 1930s corporate America. Here is a closeup of the nib ~ a medium 14k with a hint of flexibility. The Hutcheon Brothers logo is on one side of the barrel. 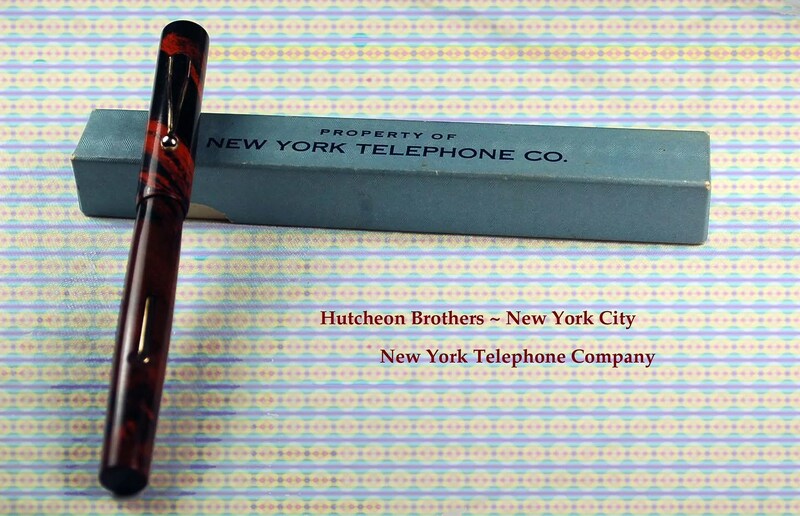 I have little information about Hutcheon Brothers other than that the Manhattan Pen Maker Project (click for link) lists their address as 241 Centre Street in New York City in 1931. I have seen a few other pens of theirs over the years – some in hard rubber and some in gold or gold plate, however this is the first I have owned. Fountain pens are no stranger to Phone Companies. A somewhat common find is the Esterbrook Black LJ sized pen that is often found with the Bell Systems Property stamp on it. I have photographed one here next to the Hutcheon Brothers. I would be interested to hear of other large Companies that purchased and distributed pens to their employees, stamping them for identification. 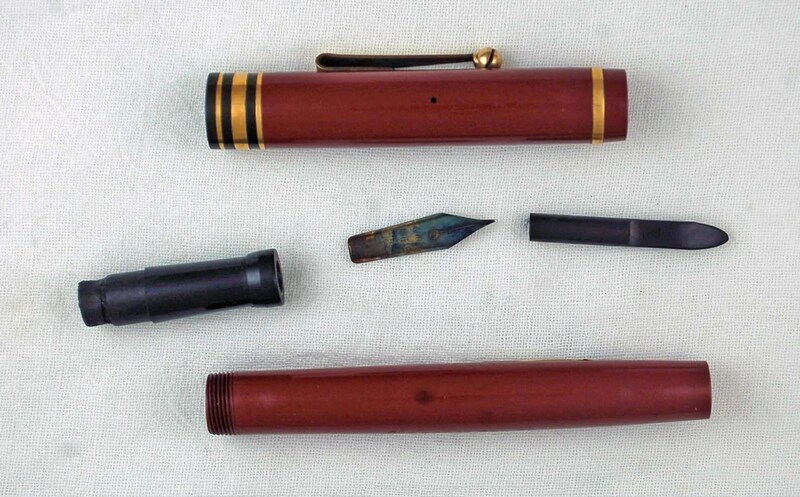 On June 1, 2009 I posted a restoration of a Japanese Sea Gull Fountain Pen. It was an aerometric-fill Parker Vacumatic look alike. Clicking on the link will show photos and detail the restoration. Since that time, I have not seen another Sea Gull, until I picked up this lever filler recently. Below is a photo of the pen after I took it apart. No particular problems with the components other than the usual wear. My guess is that it was unused, as there are no ink remnants on the feed or nib, and the barrel has maintained its original color. The pattern is often referred to as Koi. I have most often see this pattern on modern Platinum Fountain Pens, produced in Japan. The trim on the clip and cap presented the biggest challenges on this pen. As you can see from the photo above, there has been considerable brassing to both. I was able to take most of the darkening off of the cap band and clip as you can see below. After taking the pen apart and cleaning the gold trim for quite some time, I refit the feed and nib back into the section. I then trimmed a size 16 sac to fit in the barrel and it fit snugly with the usable jbar already inside. I covered the sac with talc to assure a smooth fit. Note that the section is a threaded fit, not friction, a nice touch for a pen of this size and quality. A photo of the finished product is below. It is a very small pen, measuring 4 1/16 inches capped and 4 13/16 inches posted. 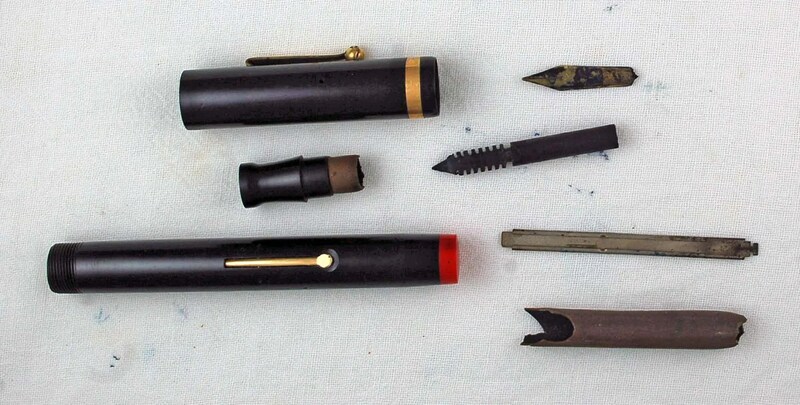 This photo of the nib shows that it is in unused condition, and marked “Special Pen”. This reminds me of the Aerometric Sea-Gull that I restored in June of 2009 that had the phrase “Special Best In The World” printed on the aerometric filler pressure bar. The maker of Sea-Gull Fountain Pens clearly enjoyed using Special as its adjective of choice. My favorite part of this pen is the clip which is held on by the black plastic jewel which screws in to the top of the cap. The clip seems overly ornate for this pen and has the words SEA GULL printed top to bottom. Here is the imprint for Sea Gull Fountain Pen. 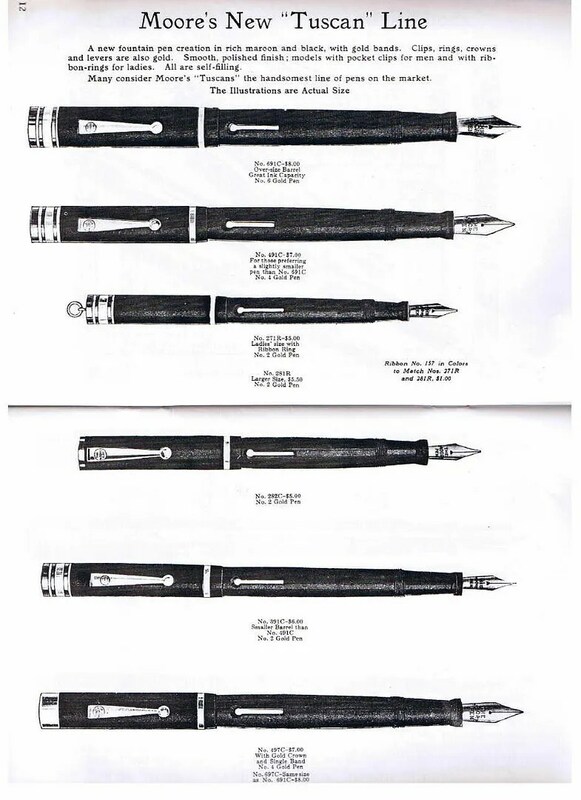 As covered in the June 2009 post, Sea Gull Pens were Japanese made and active in the 1950s. The previous aerometric filler Parker clone would seem to fit that time period. This lever filler would seem to come from an earlier time period, but I have no way of knowing its production dates. If any of you have any additional information on these pens, I would love to hear from you. After the pen was finished, I filled it up with Waterman Red, a bright orangy red that matches the koi spots. It works well with the rigid fine nib. Though my collection primarily focuses on vintage US pens, it is fun to venture to Europe and Asia from time to time to find less than common pens.